...is cutting lots of flowers for the house....but I really don't need an excuse. Thank you, Pink 23 and Leanne! 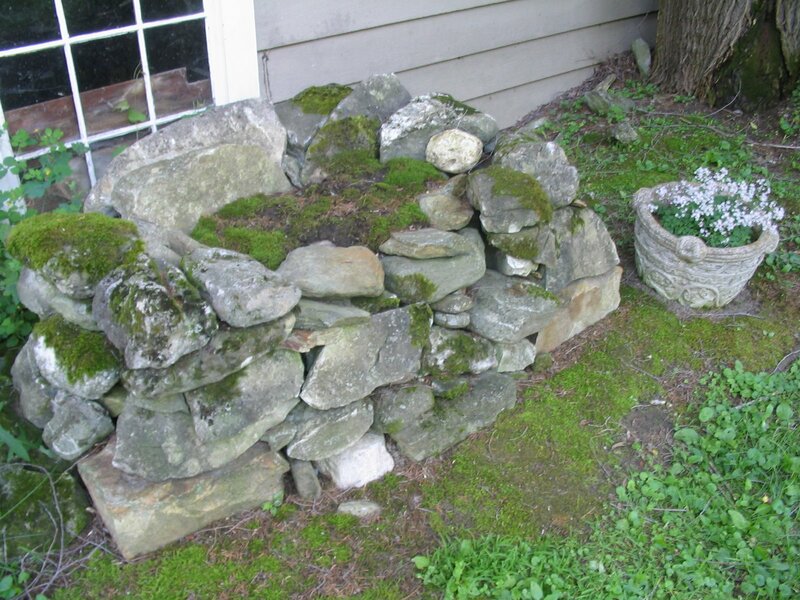 Here is my cherished stone bench, which is really my garden "folly" in the traditional as well as literal sense, since one cannot sit on it! This is the camomile bench at Sissinghurst. It inspired the lovely, mossy pile of rocks behind my own garage. Neither bench can be sat upon, but mine at least does not sport signs. I wish I knew how to airbrush those little signs out of what would then be a perfect picture. Here is a sigh-worthy, classic shot of "English Garden In Summer," courtesy of Renishaw Hall Gardens, the dark horse favorite of my travels here in the Green and Pleasant Land. This willow-leafed weeping pear tree is from the gardens of the unsung and utterly ravishing Renishaw Hall. Also in Derbyshire, and home of those wacky Sitwell Siblings, Osbert, Edith and Sacheverell. (Try pronouncing that last one.) So famous and celebrated in social and literary circles in the 20s to the 50s, now they are just known as oddballs. The grounds combined classic elements with blowsy perennials, and has many little nooks and garden "rooms." I think this garden is now my favorite of all the famous ones I saw! one of the undergardeners needs to take a chill pill! Then, as we approach the great house--uh--where is it? Under renovations, draped as if by Christo, possibly due to (1) there's a new Duke, and Debo has moved to a dower cottage, and (2 ) they want things nice for the Olympic year? It's a tad disappointing not to see the majestic pile from the lake and emperor fountain, but we came to see the gardens, anyway. It's all very idyllic, if feudal in origin! Inside an architect-designed black box on temporary view in Hyde Park is a small, enclosed jewel of a Piet Oudolf garden. I arrived shortly before opening time, to ensure some quiet contemplation, and found my dearest late-summer love, Joe Pye. Here are my notes, where I am trying to discern the movement of the planting design. Quite a "private lesson" from the premier garden designer du monde!